Recently I chatted with a clinical social worker, Darla M., who was doing her best to help a struggling family. Darla's agency has a contract with the county child welfare agency to provide home-based services to families in distress. The Robertson family was referred to Darla's agency by a local judge who was overseeing allegations of child neglect involving the parents' 4-year-old child, Naomi. According to child welfare officials, Naomi is severely malnourished and has not received regular pediatric care. Darla visits weekly with the Robertson family. She provides casework services, coordinates health care appointments for Naomi, and offers the parents supportive counseling to help them with parenting skills. One weekday afternoon, Darla arrived at the Robertsons' home for an appointment. Mrs. Robertson answered the door and told Darla that she was surprised to see her there; Mrs. Robertson said that she thought they were scheduled to meet the following day. She apologized, invited Darla in, explained that the family had just sat down to eat, and asked Darla to join the family at the table. As a seasoned social worker, Darla understands the importance of maintaining clear boundaries in her relationships with clients. She is careful to avoid social contact with clients, unwarranted self-disclosure, and inappropriate online interactions. But Darla also understands that social workers who provide home-based services sometimes need to be more flexible in their thinking about boundaries. Although Darla would not ordinarily share a meal with clients if she were working in a traditional office setting, she has learned that when she provides home-based services there may be occasional instances when joining the family at the table for a brief time may be appropriate. "Sometimes families who receive court-ordered services are resistant to what I have to offer," Darla says. "Several times during my career I have discovered that when a family invites me to their table, it's their indirect way of telling me that they're finally 'letting me in,' that they have accepted me. In some cultures, breaking bread with a stranger has a lot of meaning. Sometimes this gesture jumpstarts our professional relationship. I need to be sensitive to that." Some ethical judgments in social work are clear-cut. There is no debate about whether it is permissible for clinical social workers to date a client, falsify records, or bill for services that were never provided. These actions are wrong, pure and simple, but once we get beyond these obvious circumstances, social workers often have different opinions about the best way to manage ethical dilemmas. Principled and thoughtful practitioners may disagree about the best way to manage complex boundary issues when social workers practice in small, rural communities; whether it is ever appropriate for social workers to share personal information with clients for therapeutic purposes; and the fairest way to allocate limited resources when social service agencies face severe budget cutbacks. For example, it may be appropriate for a social worker who is in recovery, and who works in an addictions program, to share that fact with a client as part of the program's clinical model. However, such self-disclosure may be prohibited if this social worker is employed in a state prison and counsels inmates who struggle with addiction. A social worker employed by a mental health center in a large city should avoid having her client repair her car because of the potential conflict of interest. But, a social worker who lives and works in a very small, rural community may not have a choice if her client is the only car mechanic in the remote town. In other words, context matters. Between relatively straightforward black-and-white ethical issues—where the distinction between right and wrong is clear—are circumstances filled with multiple shades of gray. The ethical challenge faced by Darla is a good example of the importance of context when social workers make difficult ethical judgments. She had to decide in the moment—in real time—how to handle the boundary issue created by the family's invitation to join them for a meal. Darla was not able to stop the action and consult with colleagues or a supervisor. Some social workers might argue that Darla should not take the risk of confusing boundaries by joining the Robertsons at the meal table. 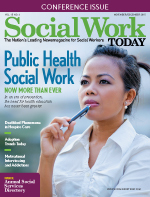 Others might argue that more flexible boundaries are permissible when social workers provide home-based services, given the lack of structure typically provided by office-based social service settings. In complex ethics cases, reasonable minds can differ. When I encounter gray-filled ethical dilemmas, I often think about what has become known as Rubin's vase. Rubin's vase is a well known cognitive optical illusion developed by the Danish psychologist Edgar Rubin. Some viewers perceive two black faces staring at each other. Other viewers perceive a white vase on a black background. All viewers see the exact some picture; what differs is their perception. The same is true in social work ethics. What seems abundantly clear to one social worker may not be at all obvious to other practitioners. It's a matter of perspective. The lack of clarity social workers find in the face of some ethical dilemmas should not lead us to conclude that "anything goes." It is critically important for social workers to appreciate the distinction between black-and-white ethical circumstances—where the "right" answer is abundantly clear—and gray-filled ethical dilemmas in which reasonable, thoughtful, and principled social workers reach different conclusions, even though they are examining the very same circumstances. This phenomenon is not unique to social work. Indeed, every profession faces a comparable challenge. In difficult medical situations, experienced and talented physicians can examine the same patient, lab results, and X-rays and reach different conclusions about the best way to treat complicated symptoms. Experienced and talented criminal defense attorneys in the same law firm may have different opinions about the best way to defend a client who has been charged with a serious crime. Experienced and talented civil engineers may examine the very same deteriorating bridge and offer different recommendations about the best way to approach repairs. The bottom line is that professional life is filled with ambiguity. Skilled practitioners accept this reality and cultivate sound protocols for dealing with this inevitability. At the very least, social workers who encounter ambiguous ethical dilemmas know how important it is to consult with thoughtful colleagues and supervisors, the NASW Code of Ethics, and literature on ethical dilemmas and decision-making. In the end, this is the very best way to cope with multiple shades of gray in social work ethics.